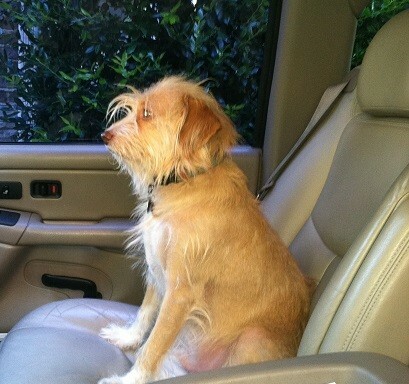 Our own “Rocky” the lightning dog on the way to office. Outdoor lighting provides an endless plethora of benefits to homeowners. These benefits encompass enhancing the beauty and curb appeal of the home and landscape while promoting a safer more secure home. Did you ever think about the ways outdoor lighting enhances the time our furry friends spend outdoors too? For most of us, our dog is considered a member of the family– not just man’s best friend, but everyone’s best friend — with that in mind, outdoor lighting can make those evening trips outdoors safer and more enjoyable for both you and your pet. If you are a dog owner there is no escaping the inevitable need for evening walks. For some pet parents, taking a stroll after dark seems easy, but if you live in a secluded area with limited lighting or lots of traffic, this may be a source of trepidation. For homeowners who have a fenced backyard, or designated area of their landscape to turn their dog out into instead of walking their dog, a dark backyard is still a source for concern for the safety of your pet. This can be even more of a concern in rural areas where wildlife frequents your property. 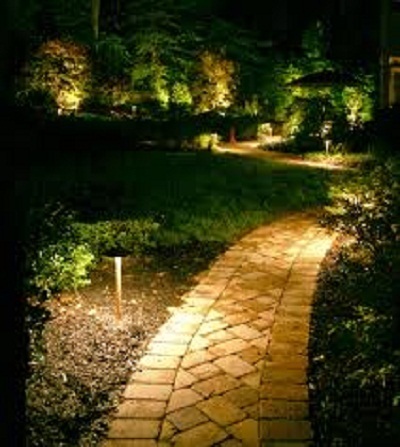 The addition of outdoor lighting such as path, sidewalk and various landscape lighting can aid in making evening visits outdoors more enjoyable and safer for both you and your pet. Outdoor lighting will allow you to return from evening walks into a well-lit environment allowing for relaxed, safer entry back into the home. For pets that have specified areas within your landscape, outdoor lighting will make the time they spend outdoors in the evening safer because of the extended visibility it offers both you and your pet, also giving you peace of mind. Path and landscape lighting aids in more secure travel when venturing outdoors in the evening with your pet. Outdoor Lighting Perspectives of Nashville specializes in outdoor lighting designed to enhance the lifestyle of every member of the family, including our four-legged family. From landscape and architectural lighting to make accessing the backyard a relaxed experience for you and your pet, to path and sidewalk lighting allowing well-lit passage on the way to and from your evening walks. We take your comfort and safety seriously. Bring a flashlight — Once you leave the security of your well-lit landscape to come home to make sure you have a dependable source of illumination for you and your pet while on the go. Portable flashlights are great, as are other sources of illumination, like headlights and lanterns. Remember you should always leave your house with a device that will help you observe the paths and roads ahead. Some of the newest pet-friendly sources of illumination include blinking LED lights, light sticks or illuminated dog collars, all of which can be a great way to maintain visibility for both you and your dog! Bring your cell phone — Before you throw on your jacket and fasten a leash to your dog’s collar, be sure you have your cell phone on hand. According to Dogster.com, this is also a great way to maintain a sense of time while you’re outside and reach out to others in case an emergency occurs. 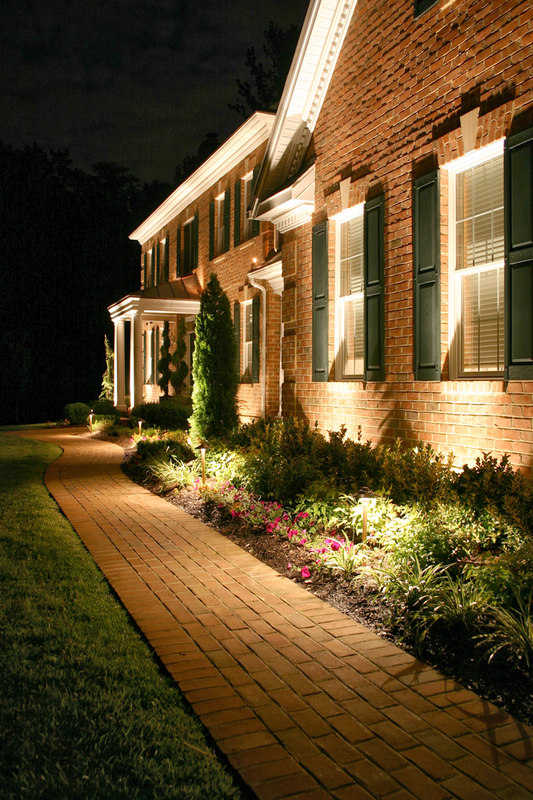 A safe, well-lit house for you and your pet to return home to courtesy of Outdoor Lighting Perspectives of Nashville. Make you and your pet easy for others to see with reflective gear — Wear reflective gear to aid in making you and your dog more visible to people driving. This includes walking on a sidewalk in a gated community or while near a busy intersection, it’s important that others are able to see both you and your pet. There’s a variety of reflective gear that will make it easier for those passing by to spot you, including reflective shirts, full body gear, illuminating collars and even leashes. Enjoy the moment — Leave distractions at home and enjoying this time to bond with your pet. While you may be tempted to plug-in your earbuds as you head out with your dog, this will inevitably distract you. Instead, try to be as observant as possible while you and your pooch enjoy the fresh air and time together outside. Please visit our landscape outdoor lighting photo gallery and our architectural outdoor lighting photo gallery located on our website to get more ideas about how to make your evening landscape pet-friendly for your pooch! This entry was posted in Architectural outdoor lighting, Landscape Lighting, Outdoor Lighting, Outdoor lighting fof enhanced safety, Residential outdoor lighting and tagged architectural lighting, dogster.com, How outdoor lighting can make your Nashville TN home and landscape pet freindly, Making your Nashville backyard safer for your dog at night, Making your Nashville backyard safer for your dog with outdoor lighting, Nashville dog friendly outdoor lighting designs, Nashville landscaped outdoor lighting, Nashville safety lighting, Nashville tips for dog walking in the evening, Nashville TN landscape lighting, Nashville TN outdoor lighting with pets in mind, Nashville TN path lighting, Nashville TN pet friendly landscapes, Nashville TN sidewalk and entry lighting, Outdoor Lighting, outdoor lighting Nashville by outdoorlightingnashville. Bookmark the permalink.